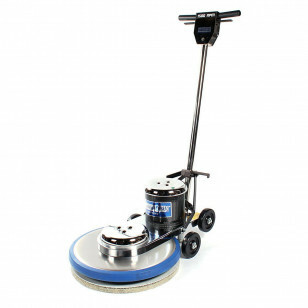 This Trusted Clean 20 inch floor burnisher machine runs at 1,500 RPM and is constructed of highly polished stainless steel and chrome plated steel. It is great polishing tiled floors in commercial institutions. Due to its highly polished appearance, this high speed floor burnisher is great for places where the general public may see you using this unit. If maintained properly, the machine's outer shell will contain a high polish for years to come. The Trusted Clean 1500 RPM burnisher is extremely durable and dependable. It comes with a stainless steel brush cover and and all metal chassis. Made in the USA. Backed by a 3 year power train warranty, and 1 year on parts & labor. Please feel free to take a look at our complete line of electric floor burnishers for other options such as plastic or powder coated steel models. 4 wheels for easy transportation. I use these product and is very efficient, the floor still shining and the burnisher safe me a lot of time because is to fast. I really satisfy with my burnisher.